Chrome Clock low profile for recessed fitting into bulkhead. Heavy cast brass instrument case, quality chroming fitted with rubber sealing ring making it suitable for marine applications. Prestige Range. Retro Black Dial with silver face markings and pointers. The case is lacquered and varnished and requires little maintenance. Recessed fitting (10mm required) allows the instrument to sit low in the bulkhead so that it does not protrude more than 30mm. The clock is quartz driven. 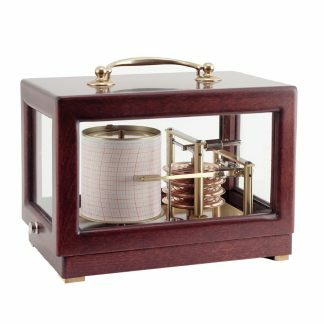 The hinged door design allows easy access to the Clock for any adjustments or battery replacement, without removal of the instrument from the bulkhead. Three chrome screws are supplied for fitting. 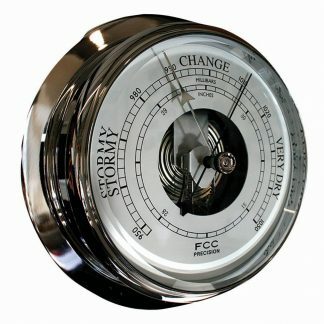 Matching barometer available. 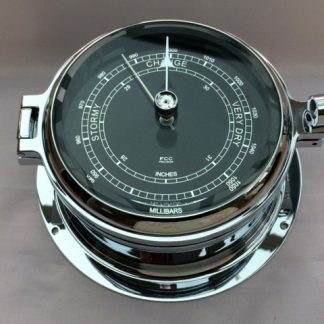 Stunning Clock for boat or home. Chrome Clock low profile for recessed fitting into bulkhead. 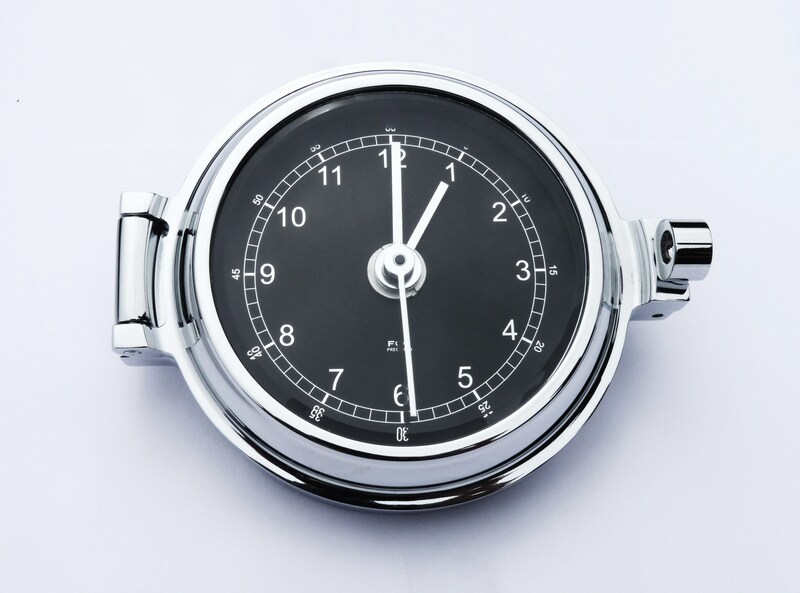 This Chrome Clock is part of our Prestige Range. Heavy cast brass instrument case, quality chroming fitted with rubber sealing ring making it suitable for marine applications. The recessed fitting (10mm required) allows the instrument to sit low in the bulkhead so that it does not protrude more than 30mm. The clock is quartz driven. The hinged door design allows easy access to the Clock for any adjustments or battery replacement, without removal of the instrument from the bulkhead. Three chrome screws are supplied for fitting. 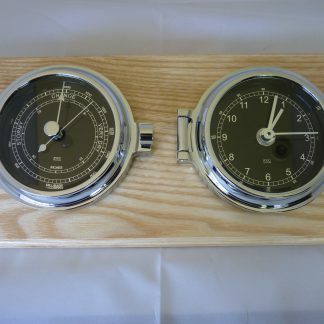 Matching barometer available. Stunning Clock for boat or home. Battery supplied with Clock (Super Alkaline 1.5GP LR1). We recommend the battery be replaced every 12 months to avoid leakage. We do not recommend the use of rechargeable batteries. All Clock movements are guaranteed for a period of 2 years. We are very proud that we have many clocks still in service which are over 25 years old! 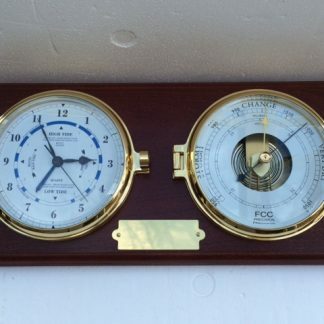 FCC Precision has been established for over 35 years and widely recognised as one of the leading specialist suppliers of marine Clocks and Barometers, supplying Princess Yachts and Cornish Crabbers for many years. We are based in Cornwall in the heart of the boating and sailing community.